The World Health Organization just issued a report stating that cellphones are "possibly carcinogenic to humans". Specifically, WHO found "an increased risk for glioma, a malignant type of brain cancer, associated with wireless phone use". The WHO report notes that a previous study showed increased risk with increased cellphone use, and recommends taking actions - such as using hands-free equipment - to reduce exposure to the electromagnetic fields produced by cellphones. The agency now lists mobile phone use in the same "carcinogenic hazard" category as lead, engine exhaust and chloroform. radio frequency electromagnetic fields, such as those emitted by wireless communication devices. As such, the WHO report may give ammunition to those who oppose non-essential radio frequency electromagnetic fields, such as California residents who oppose the installation of "smart meters" by the local power company. The smart meters wirelessly beam electric usage information to the power company. The utility installed the smart meters on all customers' homes (without their consent) in order to save the cost of having workers manually check electric meters. The [EKG]works mostly by detecting and amplifying the tiny electrical changes on the skin that are caused when the heart muscle "depolarizes" during each heart beat. Electrocution can kill by disrupting the heart's electrical system. Cellphones aren't just potentially hazardous to us. Researcher Daniel Favre of the Swiss Federal Institute of Technology has found that wireless signals cause honeybees to become so disoriented that they finally just die. [Link] Favre’s team conducted 83 separate experiments that tested bees’ reactions to a nearby cellphone. The team found that honeybees made 10 times the amount of noise when a cell phone made or received a call than they did when the phone was in off or standby mode. As Fast Company reports, this noise (generally known as “worker piping”) usually signals the bees to leave the hive. But when the reaction is triggered by a cellular signal, the bees just became tragically befuddled. It’s the “dramatic…colony losses” part that everyone should be concerned about. Honeybees are responsible for pollinating about 70 percent of the 100 or so crops on the entire planet that humans use for food. So-called “colony collapse disorder” among the world’s bee population has been recorded since 1972. But it wasn’t until 2006 that the drop in the bee population took a nosedive, with beekeepers noting a 30 to 90 percent loss of their bee colonies, up from 17 to 20 percent in previous years. Favre’s study corroborates a 2008 report that showed that honeybees would not return to their hive when a cell phone was placed nearby, which sparked the theory that wireless signals are the problem. Several weeks a go a paper out of China provided powerful epidemiologic evidence for cell phone use and parotid gland tumors. (This salivary gland is located just below and in front of the ear.) Other tumors that have been linked to cell phone use include acoustic neuroma (a common, benign tumor of the cranial nerve to the inner ear), glioblastoma multiforme (a very malignant brain tumor seen most often in older ages) and meningioma (usually benign tumors of the brain and spinal cord lining). Although benign, these tumors still require very delicate brain surgery, and may still kill the patient. While the snake oil salespeople at the retail investing level and the bobble heads on the kool aid selling financial channels have been saying for years that we're in a "recovery" (albeit a slow one), billion dollar fund managers say that nothing has changed and we'll have another crash. Ultimately creditors and investors are at the behest of a central bank and policymakers that will rob them of their money. Pimco co-CEO Mohamed El-Erian predicts that "financial repression" in the form of a negative real rate of return for savers is coming to America. Even some senior Wall Street executives acknowledge the lack of change surprises them, given how poorly the industry performed last fall and the degree of government support necessary to keep it from collapsing. While the big boys try to sell the "dumb money" on a recovery under a "greater fool" theory, the smart money knows the score. On May 12, it was confirmed that a meltdown had occurred at the No. 1 reactor, forcing the utility to abandon the water entombment idea and try to install a new cooling system that decontaminates and recycles the radioactive water flooding the reactor's turbine building instead. In other words, Tepco has no idea how long it will take to contain the leaking reactors. Tokyo Electric Power Co. did not fully disclose radiation monitoring data after its Fukushima No. 1 nuclear plant was crippled by the March 11 earthquake and tsunami, the government revealed Friday. Chief Cabinet Secretary Yukio Edano, after being informed by Goshi Hosono, a special adviser to Prime Minister Naoto Kan, told reporters that he instructed Tepco to sort out the data, make it public and make doubly sure no more information-withholding occurs. Coming a day after he blasted Tepco's flip-flop over the injection of seawater into the plant's reactor 1, Edano said the government "cannot respond to this matter on the premise" that no more undisclosed information will emerge. "There is a distinct possibility that there is still more," he said, urging Tepco to accurately and swiftly report the truth to the government. Hosono also noted Tepco's delay in revealing this fact, 2? months after the nuclear crisis started. The government will look into how this happened, the two officials said. You've already heard that 3 of the Fukushima reactors melted down within hours of the earthquake. A senior nuclear regulatory official in the United States said Thursday he believed there was a "strong likelihood" of serious core damage and core melt at the Fukushima No. 1 power plant in the days immediately after the crisis began. "There were numerous indications of high radiation levels that can only come from damaged fuel at those kinds of levels," said Bill Borchardt, executive director for operations at the Nuclear Regulatory Commission. "So we felt pretty confident that there was significant fuel damage at the site a few days into the event." The NRC also had "suspicions" about the conditions of the spent fuel pools, Borchardt said after a speech at the Japan Society in New York. Based on that assumption, he said, the NRC recommended that U.S. residents in Japan stay 80 km away from the crippled power plant, which was far beyond the Japanese government's recommendation for residents within a 20-km radius to evacuate. The operator of the damaged Fukushima Daiichi nuclear power plant says temperatures in the Number 5 reactor and its spent fuel storage pool have risen due to pump failure. The reactor has been in a state of cold shutdown. Tokyo Electric Power Company says it found at 9 PM on Saturday that a pump bringing seawater to cooling equipment for the reactor and pool had stopped working. TEPCO says temperatures have been rising since then. The typhoon has already brought heavy rain to the Fukushima region and there is still more to come. This has prompted worries that runoff water may wash away radioactive materials from the land into the Pacific Ocean. The plant operator, Tokyo Electric Power Company (TEPCO) has been pouring synthetic resins over the complex in an attempt to stabilise the plant. More work needs to be done, not just now but also to ensure that future typhoons would not spread radioactive materials into the environment. Officials from the Tokyo Electric Power Company (TEPCO) are apologizing in advance for the fact that the stricken Fukushima nuclear plant is not ready for the high winds and heavy rain of Typhoon Songda, a massive storm that could make landfall in Japan as early as Monday. The BBC quotes a TEPCO official as saying, "We have made utmost efforts, but we have not completed covering the damaged reactor buildings. We apologize for the lack of significant measures against wind and rain." Buildings housing the plant's nuclear reactors are still standing open in the wake of crippling hydrogen explosions that followed Japan's March 11 earthquake and tsunami. The approaching storm could scatter highly radioactive materials into the air and sea. Plant operators are currently spreading "anti-scattering agents" around the buildings housing reactors one and four. As I've predicted for a long time, the Fukushima disaster could end up being much worse than Chernobyl. See this, this, this and this. Radiation released by the crippled Fukushima Daiichi nuclear power plant has caused soil contamination matching the levels seen in the Chernobyl disaster in some areas, a researcher told the government's nuclear policy-setting body Tuesday. The size of the contaminated areas in the Fukushima crisis is one-tenth to one-fifth of those polluted in the Chernobyl disaster, Kawata said. It's not just the soil, it's also the seafloor. NHK notes that radiation has been found in the entire 300 kilometer (186 mile) region of the coast tested near Fukushima. For all the focus on land-based contamination, the continuing flood of radioactive materials into the ocean at Fukushima could have the most problematic long-term impacts. Long-term studies of radiological impacts on the seas are few and far between. Though some heavy isotopes may drop to the sea bottom, others could travel long distances through their lengthy half-lives. Some also worry that those contaminants that do fall to the bottom could be washed back on land by future tsunamis. "After Chernobyl, fallout was measured," says Buesseler, "from as far afield as the north Pacific Ocean." A quarter-century later the international community is still trying to install a massive, hugely expensive containment structure to suppress further radiation releases in the wake of Chernobyl's explosion. But avenues to the sea would also have to be contained. Fukushima is much closer to the ocean than Chernobyl, so more intense contamination might be expected. But the high radiation levels being measured indicate Fukushima's most important impacts may be on marine life. Just because mega-radioactive water leakage was not enough. From Xinhua: "Operator of the troubled Fukushima No. 1 nuclear power plant found that oil has been leaking into the sea close to the facility, the Kyodo News reported Tuesday. The operator Tokyo Electric Power Co. (TEPCO) said the oil leaks were possibly from nearby oil tanks that may have been damaged in the March earthquake and tsunami, and it would set up oil fences to prevent the liquid from pouring into the Pacific Ocean." Oh, but they only discovered this now? Odd how it took nearly 3 months for those oil tanks to rupture and start spilling into the water. Update: While an explosion occurred near reactor 4 today, that appears to be the least of the problems at the Fukushima nuclear complex. Given the extreme uncertainty in the investing environment, and given that housing, employment and wages, and some of the other fundamental economic measures are flashing warning signs, this is not a simple question. I have written thousands of essays examining the great inflation versus deflation debate (here's the latest). I can see both sides of the argument, as well as arguments for inflation and deflation at the same time. And see this essay by Shah Gilani on Chinese inflation. Of course, even if hyperinflation never hits, food prices are forecast to rise. As such, the price of the grains with which fine liquor is made will probably increase, and so will the price of the beverage should rise as well. There is some segment of the population that is always going to have a lot of disposable income, even in these times. Indeed, the gap between the affluent and everyone else has been growing so fast that it is bigger than it has been since 1917 ... before the Great Depression. Ajay Kapur, a Deutsche Bank strategist [and] former Citigroup strategist created a stir five years ago when he built an investment strategy around his thesis that essentially divided the world into two camps: the rich and the rest. Some shrewd investment advisors have recommended buying rare art and fine wines to cater to the wealthy few. Given the widespread fear of the Japanese nuclear meltdown - whether you think it's founded or not - high-end sake made before the March 11th earthquake might be a smart investment. There are a number of Japanese billionaires. And Japan has more millionaires than any country in the world other than the U.S. At least some of these well-heeled folks have a taste for sake . And wealthy people from other countries have a taste for Japanese beverages as well. And they would likely pay top dollar to buy their favorite sakes made before the nuclear meltdown started, to make sure that they're not exposed to any radiation. A number of people have repatriated from Japan in order to avoid the devastation from the earthquake, the tsunami and the economic downturn. Thousands of people desperate to escape Japan's deepening nuclear crisis have inundated private jet companies with requests for evacuation flights, sending prices surging as much as a quarter. Workers are fleeing for Hong Kong, Taiwan, South Korea and as far afield as Australia and the United States as power outages and shortages of basic supplies compound the misery after Friday's 9.0 earthquake and subsequent tsunami. Expats will certainly be eager for a "taste of home" in the form of good sake and other Japanese luxury items. Like wine, sake doesn't last forever. Dry, high-alcohol sakes last the longest. Both heat and light will degrade the flavor of sake over time, so sake should be stored in the cool and dark. Premium sakes usually have the "daiginjo", "junmai", "ginjo", "koshu", or "genshu" classification on the label. Daiginjo is generally the most expensive sake, requiring the brewer to polish each grain of rice down to half its original size before brewing. You can get up to speed on the best sakes by reading this website (and these books) subscribing to Wine Spectator (see this and this) and by reading roundups like this. Because sake doesn't last all that long, an even smarter investment might be traditional Japanese versions of hard alcohol. Shochu (pronounced as “show-chew”) is the traditional Japanese hard liquor. Typically brewed from potatoes or wheat, shochu can also be brewed from rice, raw sugar, or even ... wait for it ... wasabi. Shochu is typically 25 to 35 percent alcohol. It was said that while wealthy people might entrust their money to others, they would always keep the keys to their awamori cellar with them. Shochu, and especially awamori, should last a long time. And they fit into John Williams' booze and gold recommendation. Note: Okinawa is over 1,000 miles from Fukushima. But the potatoes, wheat, rice or other base materials could come from closer to the site of the reactors or to other types of contamination from the Japanese disaster. More importantly, perception is key, and pre-Fukushima alcohol will likely carry a premium. Preface: Some defendants are no longer allowed to see the "secret evidence" which the government is using against them. See this and this. The U.S. Supreme Court has ruled that judges can throw out cases because they don't like or believe the plaintiff ... even before anyone has had the chance to conduct discovery to prove their case. In other words, judges' secret biases can be the basis for denying people their day in court, without even having to examine the facts. Judges are also becoming directly involved in politics with the other branches of government. Claims of national security are being used to keep the shenanigans of the biggest banks and corporations secret, and to crush dissent. But this essay focuses on something else: the fact that the laws themselves are now being kept secret. America is supposed to be a nation of laws which apply to everyone equally, regardless of wealth or power. Founded on the Constitution and based upon the separation of powers, we escaped from the British monarchy - a "nation of men" where the law is whatever the king says it is. However, many laws are now "secret" - known only to a handful of people, and oftentimes hidden even from the part of our government which is supposed to make laws in the first place: Congress. Congress just re-authorized the Patriot Act for another 4 years. Speaking on the floor of the U.S Senate during the truncated debate on the reauthorization of the PATRIOT ACT for another four years, U.S. Senator Ron Wyden (D-Ore.) – a member of the Senate Select Committee on Intelligence -- warned his colleagues that a vote to extend the bill without amendments that would ban any Administration’s ability to keep internal interpretations of the Patriot Act classified will eventually cause public outrage. Known as Secret Law, the official interpretation of the Patriot Act could dramatically differ from what the public believes the law allows. This could create severe violations of the Constitutional and Civil Rights of American Citizens. I have served on the Senate Intelligence Committee for ten years, and I don’t take a backseat to anybody when it comes to the importance of protecting genuinely sensitive sources and collection methods. But the law itself should never be secret – voters have a need and a right to know what the law says, and what their government thinks the text of the law means, so that they can decide whether the law is appropriately written and ratify or reject decisions that their elected officials make on their behalf. As members of the Senate Intelligence Committee we have been provided with the executive branch's classified interpretation of those provisions and can tell you that we believe there is a significant discrepancy between what most people - including many Members of Congress - think the Patriot Act allows the government to do and what government officials secretly believe the Patriot Act allows them to do. By far the most important interpretation of what the law means is the official interpretation used by the U.S. government and this interpretation is - stunningly -classified. Here's Wyden's speech on the Senate floor. The Justice Department should publicly release its legal opinion that allows the FBI to obtain telephone records of international calls made from the U.S. without any formal legal process, a watchdog group asserts. The decision not to release the memo is noteworthy... By turning down the foundation's request for a copy, the department is ensuring that its legal arguments in support of the FBI's controversial and discredited efforts to obtain telephone records will be kept secret. What's extraordinary about the Obama DOJ's refusal to release this document is that it does not reveal the eavesdropping activities of the Government but only its legal rationale for why it is ostensibly permitted to engage in those activities. The Bush DOJ's refusal to release its legal memos authorizing its surveillance and torture policies was unquestionably one of the acts that provoked the greatest outrage among Democratic lawyers and transparency advocates (see, for instance, Dawn Johnsen's scathing condemnation of the Bush administration for its refusal to release OLC legal reasoning: "reliance on 'secret law' threatens the effective functioning of American democracy" and "the withholding from Congress and the public of legal interpretations by the Justice Department Office of Legal Counsel (OLC) upsets the system of checks and balances between the executive and legislative branches of government." The way a republic is supposed to function is that there is transparency for those who wield public power and privacy for private citizens. The National Security State has reversed that dynamic completely, so that the Government (comprised of the consortium of public agencies and their private-sector "partners") knows virtually everything about what citizens do, but citizens know virtually nothing about what they do (which is why WikiLeaks specifically and whistleblowers generally, as one of the very few remaining instruments for subverting that wall of secrecy, are so threatening to them). Fortified by always-growing secrecy weapons, everything they do is secret -- including even the "laws" they secretly invent to authorize their actions -- while everything you do is open to inspection, surveillance and monitoring. Conversely, allowing government officials to shield their own conduct from transparency and (with the radical Bush/Obama version of the "State Secrets privilege") even judicial review ensures that National Security State officials (public and private) can do whatever they want without any detection and (therefore) without limit or accountability. That is what the Surveillance State, at its core, is designed to achieve: the destruction of privacy for individual citizens and an impenetrable wall of secrecy for those with unlimited surveillance power. And as these three events just from the last 24 hours demonstrate, this system -- with fully bipartisan support --- is expanding more rapidly than ever. Talk about "secret law." You're not even allowed to know the White House's rationale (if it exists) for why this war is legal. It simply decrees that it is, and you'll have to comfort yourself with that. That's how confident they are in their power to operate behind their wall of secrecy: they don't even bother any longer with a pretense of the most minimal transparency. Secret laws are not a brand new problem. Yale law professor Jack Balkin agrees, writing that the memos promoted "reasoning which sought, in secret, to justify a theory of Presidential dictatorship." Constitutional law professor Jonathan Turley says that the memos are the "very definition of tyranny". And former White House counsel John Dean says "Reading these memos, you've gotta almost conclude we had an unconstitutional dictator." NOW, THEREFORE, I, GEORGE W. BUSH, President of the United States of America, by virtue of the authority vested in me as President by the Constitution and the laws of the United States, I hereby declare that the national emergency has existed since September 11, 2001 . . . .
Assessment of terrorist risks persuaded the White House to remake the program as a permanent feature of 'the new reality, based on what the threat looks like,' a senior decisionmaker said. Key congressional leaders say they didn’t know President Bush had established a “shadow government,” moving dozens of senior civilian managers to secret underground locations outside Washington to ensure that the federal government could survive a devastating terrorist attack on the nation's capital, The Washington Post says in its Saturday editions. An aide to House Minority Leader Richard A. Gephardt (D-Mo.) said he was also unaware of the administration's move. Among Congress's GOP leadership, aides to House Speaker J. Dennis Hastert (Ill.), second in line to succeed the president if he became incapacitated, and to Senate Minority Leader Trent Lott (Miss.) said they were not sure whether they knew. Senate Majority Leader Tom Daschle, D-South Dakota, said Friday he can't say much about the plan. "We have not been informed at all about the role of the shadow government or its whereabouts or what particular responsibilities they have and when they would kick in, but we look forward to work with the administration to get additional information on that." Specifically, in the summer 2007, Congressman Peter DeFazio, on the Homeland Security Committee (and so with proper security access to be briefed on COG issues), inquired about continuity of government plans, and was refused access. Indeed, DeFazio told Congress that the entire Homeland Security Committee of the U.S. Congress has been denied access to the plans by the White House (video; or here is the transcript). The Homeland Security Committee has full clearance to view all information about COG plans. DeFazio concluded: "Maybe the people who think there’s a conspiracy out there are right”. So continuity of government laws were enacted without public or even Congressional knowledge, and neither the public or even Congress members on the Homeland Security Committee - let alone Congress as a whole - are being informed of whether they are still in effect and, if so, what laws govern. Postscript: As I've repeatedly noted, economics, politics and law are inseparable and intertwined. As Aristotle pointed out thousands of years ago, "The only stable state is the one in which all men are equal before the law." Without the rule of law, the state crumbles, and the government bonds and other investments crumble with it. What's the hole that is swallowing up the economy? The failure to follow the rule of law. We are supposed to be a nation of laws, not of men. That's what humanity has fought for ever since we forced the king to sign the Magna Carta. Indeed, lawlessness - the failure to enforce the rule of law - is dragging the world economy down into the abyss. 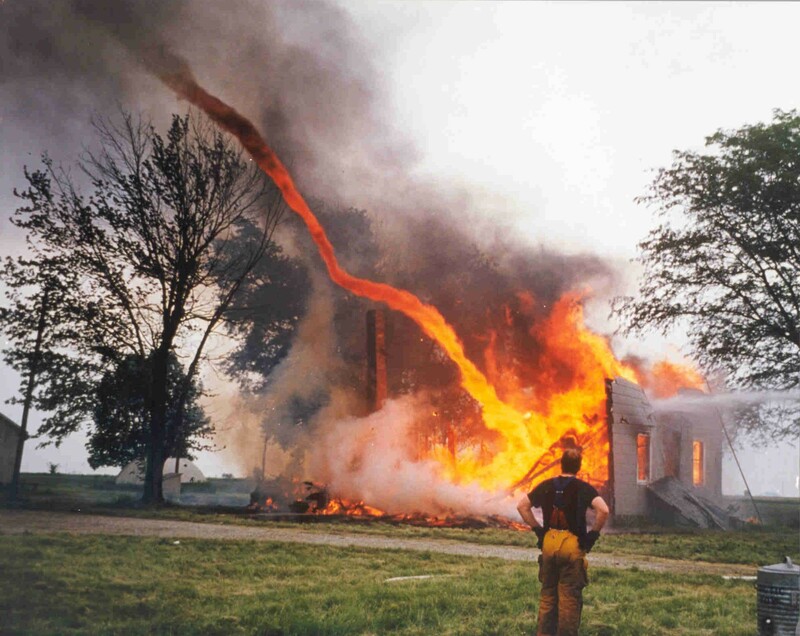 Under the right conditions, tornadoes can pick up fires and form temporary fire tornadoes. Are Our Leaders Really Incompetent ... Or Just Pretending? People want to assume that when someone in power messes up - especially someone who appears incompetent - it was just a mistake. For example, folks can't believe that an incompetent president could carry out scoundrelly deeds. "Generally, US foreign policy is remarkably consistent and cohesive, a deadly success, given the interests it represents. Those who see it as repeatedly befuddled are themselves revealing their own befuddlement. Sometimes the policymakers themselves seize upon incompetence as a cover. [For example, when the Iran-Contra affair was discovered, President Reagan pleaded incompetence.] His admission of incompetence was eagerly embraced by various analysts and pundits who prefer to see their leaders as suffering from innocent ignorance rather than deliberate deception. Subsequent testimony by his subordinates, however, revealed that Reagan was not as dumb as he was pretending to be, and that he had played an active and deciding role in the entire Iran-contra affair. No less a political personage than Henry Kissinger repeatedly pretended to innocent ignorance and incompetence when confronted with the dirty role he and his cohorts played . . . ."
This strategy of "playing dumb" and acting incompetent has, in fact, long been employed by leaders on both the left and the right. Many liberals and old fashioned conservatives have been suckered by this dumb and dumber act. Let's take a look at the actual history of Bush, Cheney and Rumsfeld for insight into whether they are incompetent leaders. After Bush lost his bid for congress because he was perceived as an over-educated, "spoiled rich kid from back East", he cultivated a bumbling, "good old boy" image, and then started winning his political elections. That's right: Bush actually cultivated a bumbling, misspeaking mannerism. Moreover, President Bush proposed painting a U.S. surveillance plane in the colors of the United Nations in hopes of drawing fire from Iraqi military, as a way to justify war against Iraq. Is this the kind of proposal that someone who is incompetent would make, or is it the kind of thing a conscious deceiver would suggest? Rumsfeld and Cheney are also long-time experts at using deception to justify their military and political goals. They were, in fact, the folks who intentionally hyped the Soviet threat during the Cold War so that the defense contractors would make a killing and the U.S. would have a suitably scary "bad guy" to rally against (see this article). These guys, like other neocons, are students of Machiavelli. Remember how the TV character Detective Columbo pretended he was bumbling and dumb, so that people would underestimate him? Or remember the TV show Matlock, where Andy Griffith pretended to be a slow-witted country lawyer in order to put people off their guard? I would argue that Bush, Cheney and Rumsfeld have also used this same trick: playing dumb. Prominent liberal figures and 0ld-fashioned conservatives have tried to warn others of the ploy. For example, liberal guru George Lakoff wrote an article in 2006 called "Bush Is Not Incompetent" which demonstrates that the Bush administration has been incredibly successful in implementing its agenda (the article is well worth reading for its evidence that Bush is not incompetent; however, I believe Lakoff confuses neoconservatism with true conservatism). Similarly, in an article entitled "Bush Didn’t Bungle Iraq, You Fools", veteran investigative reporter Greg Palast says that the administration got exactly what it wanted from the Iraqi war. And popular liberal writer William Pitt says "the 'incompetence' thing is nonsense . . . Can anyone still think this was all by accident?". Pitt recognizes that the White House, rather than being incompetent, has gotten exactly what they wanted all along -- to invade Iraq, get a foothold in the Middle East and to get control of the oil. Indeed, the neocons have openly advocated civil war and instability in Iraq and other Middle Eastern countries as a long-range strategic plan. Countries need to lie about their enemies in order to demonize them sufficiently so that the people will support the war. The U.S. Navy's own historians now say that the sinking of the USS Maine -- the justification for America's entry into the Spanish-American War -- was probably caused by an internal explosion of coal, rather than an attack by the Spanish. It is also now well-accepted that the Gulf of Tonkin Incident which led to the Vietnam war was a fiction (confirmed here). And two lies were used to justify the 1991 Gulf War: the statement that Iraqis murdered Kuwaiti babies and the statement that a quarter of a million Iraqi troops were massed on the border with Saudi Arabia (see also this article)(technically, the statement about Kuwaiti babies did not come from the U.S. government, but from a public relations firm hired by the government). Obama - like Bush before him - also appears to be totally incompetent with regard to the economy. He hasn't been able to rein in the giant banks or significantly lower unemployment. Obama is following disproven models, and has appointed economists who either helped cause the crisis in the first place, or who have drunk the kool-aid of failed economic theory. But Obama has actually been serving "his constituency": Goldman Sachs and the other Wall Street giants which funded his campaign. As I have repeatedly noted, mainstream economists and financial advisors have been using faulty and unrealistic models for years. See this, this, this, this, this and this. The decision to use faulty models was an economic and political choice, because it benefited the economists and those who hired them. For example, the elites get wealthy during booms and they get wealthy during busts. Therefore, the boom-and-bust cycle benefits them enormously, as they can trade both ways. Specifically, as Simon Johnson, William K. Black and others point out, the big boys make bucketloads of money during the booms using fraudulent schemes and knowing that many borrowers will default. Then, during the bust, they know the government will bail them out, and they will be able to buy up competitors for cheap and consolidate power. They may also bet against the same products they are selling during the boom (more here), knowing that they'll make a killing when it busts. But economists have pretended there is no such thing as a bubble. Indeed, BIS slammed the Fed and other central banks for blowing bubbles and then using "gimmicks and palliatives" afterwards. It is not like economists weren't warning about booms and busts. Nobel prize winner Hayek and others were, but were ignored because it was "inconvenient" to discuss this "impolite" issue. Likewise, the entire Federal Reserve model is faulty, benefiting the banks themselves but not the public. The problems of a massive debt overhang were also thoroughly documented by Minsky, but mainstream economists pretended that debt doesn't matter. And - even now - mainstream economists are STILL willfully ignoring things like massive leverage, hoping that the economy can be pumped back up to super-leveraged house-of-cards levels. As they did in the two revolutions in economic thought of the past century, economists are rediscovering relevant work. It is only "rediscovered" because it was out of favor, and it was only out of favor because it was seen as unnecessarily crimping profits by, for example, arguing for more moderation during boom times. The powers-that-be do not like economists who say "Boys, if you don't slow down, that bubble is going to get too big and pop right in your face". They don't want to hear that they can't make endless money using crazy levels of leverage and 30-to-1 levels of fractional reserve banking, and credit derivatives. And of course, they don't want to hear that the Federal Reserve is a big part of the problem. The quest is bringing financial economists -- long viewed by some as a curiosity mostly relevant to Wall Street -- together with macroeconomists. Some believe a viable solution will emerge within a couple of years; others say it could take decades. [As one Nobel prize winning economist stated,] "In pointing out the consequences of a set of abstract assumptions, one need not be committed unduly as to the relation between reality and these assumptions." This attitude did not deter him from drawing policy conclusions affecting the material world in which real people live. These conclusions are diametrically opposed to the empirically successful protectionism by which Britain, the United States and Germany rose to industrial supremacy. "Economic theory proper, indeed, is nothing more than a system of logical relations between certain sets of assumptions and the conclusions derived from them... The validity of a theory proper does not depend on the correspondence or lack of it between the assumptions of the theory or its conclusions and observations in the real world. A theory as an internally consistent system is valid if the conclusions follow logically from its premises, and the fact that neither the premises nor the conclusions correspond to reality may show that the theory is not very useful, but does not invalidate it. In any pure theory, all propositions are essentially tautological, in the sense that the results are implicit in the assumptions made." Such disdain for empirical verification is not found in the physical sciences. Its popularity in the social sciences is sponsored by vested interests. There is always self-interest behind methodological madness. That is because success requires heavy subsidies from special interests, who benefit from an erroneous, misleading or deceptive economic logic. Why promote unrealistic abstractions, after all, if not to distract attention from reforms aimed at creating rules that oblige people actually to earn their income rather than simply extracting it from the rest of the economy? Plundered the treasury to effect "a massive redistribution of wealth to the bank shareholders and their top executives"
These aren't the only areas where the "incompetence" card was played. If people inside the administration actually held back from capturing Osama bin Laden when we had him cornered, it borders on treason. The information provided by European intelligence services prior to 9/11 was so extensive that it is no longer possible for either the CIA or FBI to assert a defense of incompetence. The vice president and the secretary of defense created a "Cheney-Rumsfeld cabal" that hijacked U.S. foreign policy. “We are in a cabal... five or six players ... own the regulatory apparatus. everybody is afraid to regulate them"
As I noted last week, reactors 1, 2 and 3 all melted down within hours of the Japanese earthquake. Chris Allison [a former manager and technical leader at Idaho National Laboratory], who had actually developed the analysis and simulation software, reported the result to the International Atomic Energy Agency (IAEA) in late March. It was only May 15 when Tokyo Electric Power Co. (TEPCO) admitted for the first time that a meltdown had occurred at the No. 1 reactor at the Fukushima nuclear plant. In other words, the IAEA knew in late March that there was a meltdown. The IAEA informs all of its member states of important nuclear developments. Government agencies sat on this information, and the world didn't learn the truth until the operator of the stricken reactors itself made the announcement a month and a half later. This is not entirely surprising given that governments have been covering up nuclear meltdowns for fifty years to protect the nuclear industry.